February 2000 — President Bill Clinton declares March to be Colorectal Cancer Awareness Month. In the official release from Clinton's press secretary announcing Colorectal Cancer Awareness Month, Clinton declared that physicians would diagnose around 130,000 new cases of CRC (colorectal cancer) 2000 alone, and that more than 56,000 of those diagnoses would result in death. Between 2009 and 2013, the United States witnessed a steady reduction in colorectal cancer diagnoses across every single state, except Arkansas. Seven of those states saw a more than 5% decrease year after year. In 2017, it was estimated that there would be around 135,500 CRC diagnoses (95,520 colon cancer, 39,910 rectal cancer) and that around 50,200 of those new diagnoses would result in death. When we consider population growth, we find that CRC-related deaths have declined over the last few decades in both men and women. In 2000, when Clinton made his claims, the population of the United States was around 282 million. In March of 2018, our population is up around 326 million. If we were still losing loved ones to colorectal cancers at the same rate as we were in 2000, instead of the estimated 50,200 deaths in 2017, there would have been around 64,000. Thanks in part to public enthusiasm and activism (the Colorectal Cancer Alliance raised nearly $4 million in gifts, grants, and donations in 2015), research and technological advancement has been funded that’s put doctors in 2018 in a favorable position, compared with those in 2000, to find and remove colorectal polyps either before they become cancerous, or while the disease is young enough to be treated. Also, studies show that Internet access increases patients’ desire to take on a more active role in their medical decisions. With the help of effective message-spreading by people who care, patients are more informed than ever before; the general public has a heightened sense of agency regarding their physical well-being—something historically conceded to as a sort of mystery by many. This brand of enlightenment creates opportunities for more people to adopt more proactive and preventative lifestyles, and for more frequent screenings; but ultimately, it leads to more lives spared from CRC. Today, there are more than one million Colorectal Cancer Survivors in the United States. Colorectal cancer is second only to lung and bronchial cancer in cancer-related deaths in the U.S. However, if caught and managed early on, colorectal cancer is highly treatable. With a little awareness and regular screenings, you can significantly reduce your risk of being victimized by this disease. Colorectal Cancer can present itself silently, with minimal symptoms or none at all, so at least minimal due diligence is suggested. 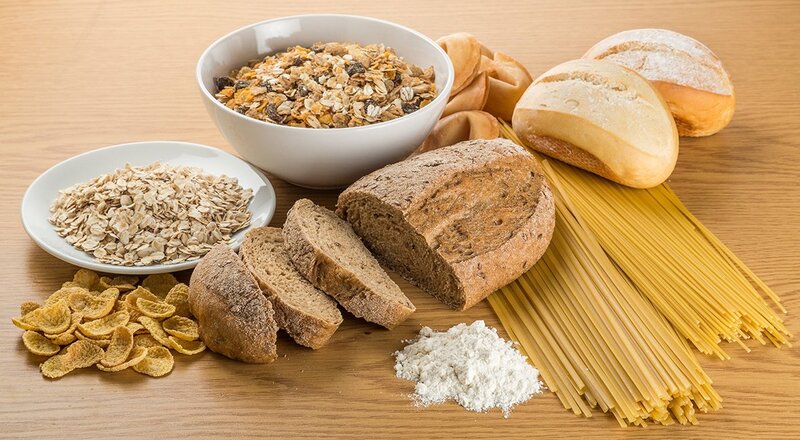 Possible symptoms that could show themselves include pain, bleeding, or a change in typical bowel habits. 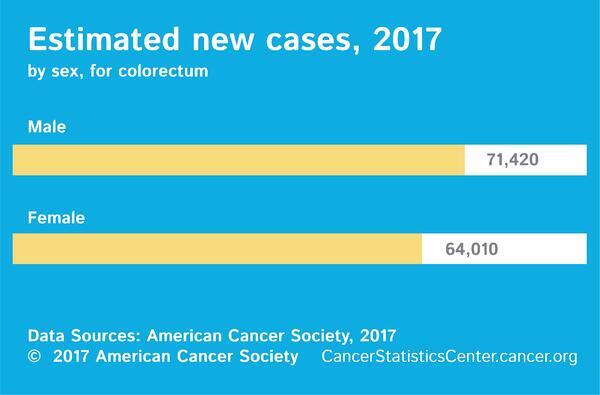 Men and women appear equally susceptible to colon cancer, but that is not necessarily true of rectal cancer; there was a slightly higher estimated number of rectal cancer diagnoses for men (23,720) than women (16,190) in 2017. People older than 50 years old are at the highest risk for Colorectal Cancer (90% of cases occur in people aged 50+) and therefore should receive regular screenings. This is particularly important if your first degree family’s medical record shows history of polyps and colon cancer which could double or even triple your risk of developing the disease. 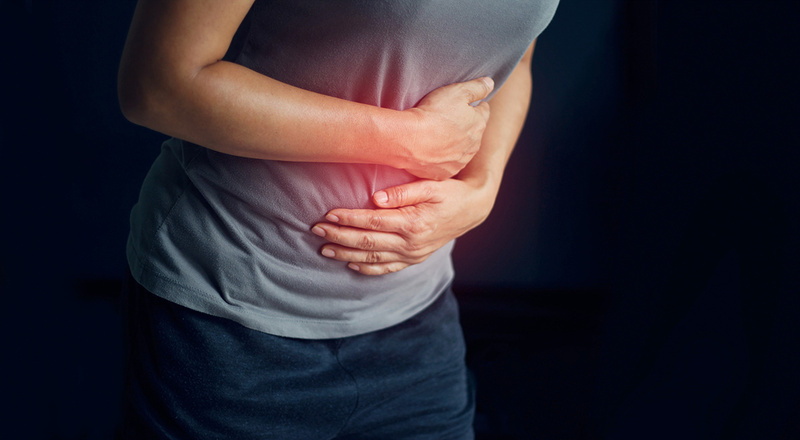 Smokers, and people with certain chronic digestive conditions, like IBD (inflammatory bowel disease), are specifically vulnerable to colon or rectal cancer growth as well. That’s not to say non-smokers younger than 45 should put screening out of their minds, though, especially if the other implied genetic risk factors listed above are applicable. Blue is the designated ribbon color for colorectal cancer awareness. Consider helping to spread awareness by organizing a “Wear Blue for Colorectal Cancer Awareness Month” day in your home, at your school, or at your place of business, and be sure to direct your friends, family, and colleagues toward helpful resources with information regarding Colorectal Cancer. Contact us for more information or to schedule an appointment, today.